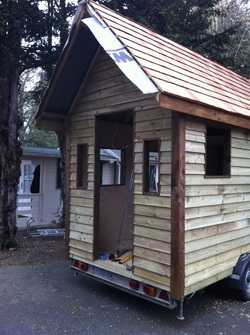 Do you want to build your own Tiny House but lack the know how and don't have the confidence to give it a go? Well help is now here. I have been building timber structures for many years and yet still get a huge amount of satisfaction once I have completed the finishing touches to my latest build. At a very young age, building camps and tree houses was almost an obsession, every project became more and more challenging with bigger and better ideas. Unfortunately my summer time hobby came to an abrupt end the day my grandmother found one of her dining room chairs up a tree along with other items from around the house which had seemed to have simply “Gone missing”! For many, it is almost a childhood dream to be able to build your own little space, a den, Wendy House or even a “Man Cave”. It has become apparent from search results and trends that a growing amount of people are looking into the possibilities of building their own Tiny House with little or no building experience in this field. Building a Tiny House may seem like a relatively straightforward procedure but even for experienced carpenters, the whole project may become more problematical when a chassis is to be used for the base and the overall weight and structure will determine if you succeed or fail. As the saying goes, it's easy when you know how. My “Tiny School” has now been launched, giving the general public with limited experience the opportunity to build their own dream Tiny House. A hands-on tutorial covering all aspects of assembling your own Tiny House with the "flat packed kit" we provide. In the kit you will have all you need to build the structure, most of which will already be cut to size ready to put together. Q: Can I attend the Tiny School without buying a "Tiny House Kit"? Q: Do you sell plans of your designs? Q: Can you ship Tiny Houses overseas? Q: Can you build a tiny house larger than 16ft? Q: Do I need planning permission to have a tiny house in my garden? A: Yes, but you have to arrange this yourself. A: Yes, By quotation only. A: To "Live in" full time...*yes. As a "garden office"...*no. *You would need to ask your local council as every application is judged individually. Its more about what its to be used for, not what it is.